Off a recent tour that included The Fireside Theater The Browns (winner of the prestigious honor of Top 10 Mixed Group of the year) are truly a family affair. The musical stylings of Shelly, Michaela, Adam, and Andrew exude excitement on the stage and offer a life-changing experience to all who hear them. The Browns deliver the powerful message of the gospel through word and song that engage audiences of all ages. 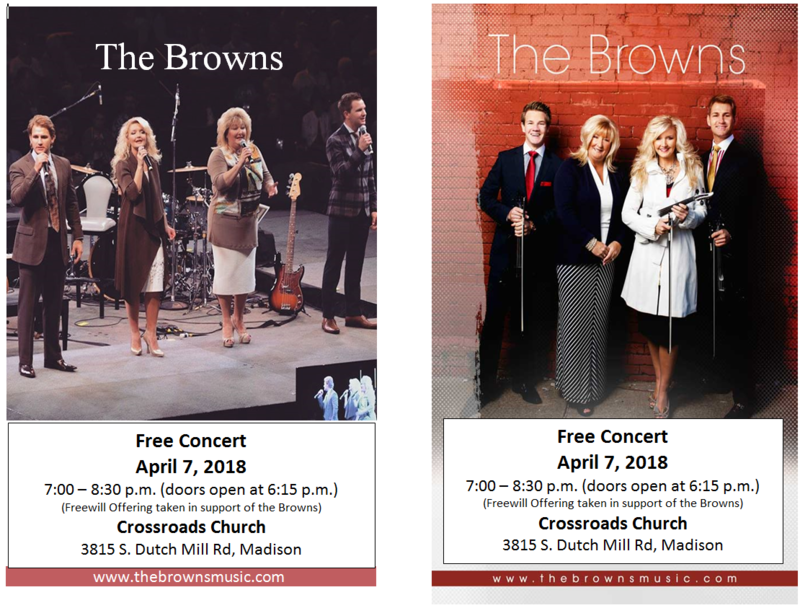 The Browns will be in concert at Crossroads Church (3815 S. Dutch Mill Rd) Saturday, April 7. The concert begins at 7:00 p.m., and is free (an offering will be taken for The Browns). Doors open at 6:15 p.m. For a promotional poster, please click here.